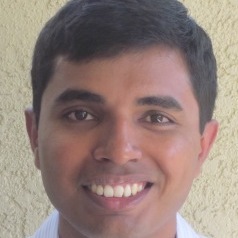 Harsha V. Madhyastha's research spans the areas of distributed systems, networking, and security and privacy. Most of his work focuses on simplifying the development of and enabling the cost-effective deployment of performant, highly available, and privacy-preserving Internet-scale software services. Many of the systems developed as part of his research have been widely used and have had significant impact. For example, WhyHigh has reduced latencies to Google by an order of magnitude for millions of users, the MyPageKeeper system for detecting social malware is in use by over 20,000 Facebook users, and Internet topology and performance data from the iPlane system has been used in research projects at over 100 institutions. His work has also resulted in award papers at the USENIX NSDI, ACM SIGCOMM IMC, and IEEE CNS conferences. His research has received support from the Army Research Office (ARO), the Defense Threat Reduction Agency (DTRA), the Intelligence Advanced Research Projects Activity (IARPA) agency, Amazon, VMware, Google, a NetApp Faculty Fellowship, and the National Science Foundation (including an NSF CAREER award).